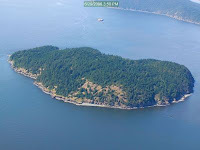 Many have thought to vacation in the San Juan Islands, but have you ever thought about owning a San Juan Island? Auction company J.P. King is now making this possible. The San Juan Island to be auctioned, Vendovi Island of Anacortes, is to be sold in the event happening in Seattle on September 30th. J.P. King is a member of Ewing and Clark's sister company, Luxuryrealestate.com, the most viewed luxury real estate website in the world. Last week, Meghan Barry of luxuryrealestate.com posted a blog on the site about the Vendovi auction, including property details and stunning photographs like the one pictured above. Please visit luxuryrealestate.com for more information.